Finn Olafsson, Denmark. Guitarist, composer, producer. 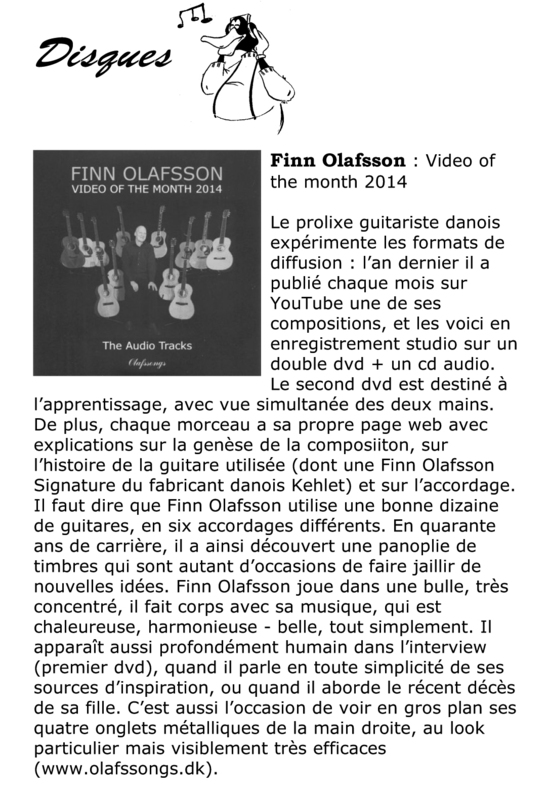 FINN OLAFSSON • The double DVD+CD set "Video of the Month 2014"
This new double DVD+CD set is the answer! 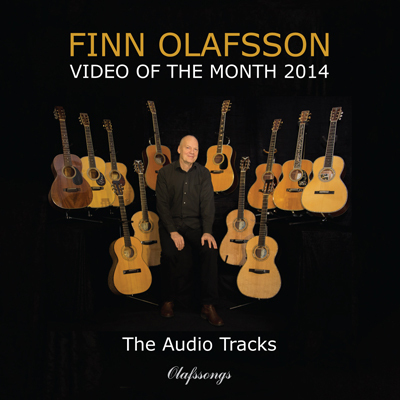 In collaboration between Acoustic Music Records, Germany, and Olafssongs, Denmark, Danish composer and acoustic guitarist Finn Olafsson presented an outstanding new double DVD+CD set at Musikmesse 2015, Frankfurt, in Germany. 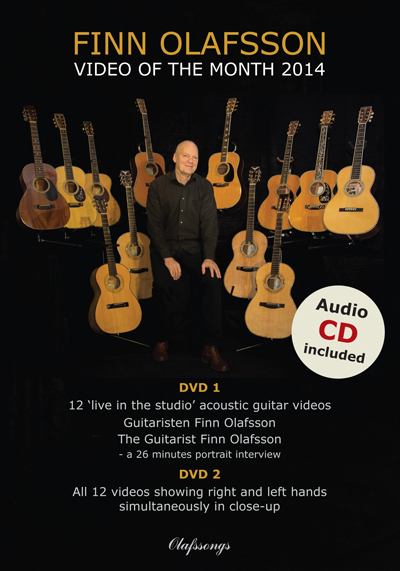 The DVD/CD set primarily contains 12 'live in the studio' acoustic guitar videos written and performed by Finn Olafsson, in two of the videos being accompanied by Torsten Olafsson on tablas. The videos were launched month by month in 2014 on YouTube. In 7 of the 12 videos Finn Olafsson plays new guitar pieces that have not yet been published on any of his albums, while 5 pieces are known from his previous albums. 6 different guitar tunings are represented - and many acoustic guitar fans will find it quite exciting that Finn Olafsson in the videos is playing various gorgeous C.F. Martin, Kehlet and David W. Musselwhite guitars. On DVD 1 you'll find the 12 videos in the "entertainment" versions which were published during 2014 on YouTube. DVD 1 also includes a 26 minutes portrait interview in two versions, one in Danish and another with English subtitles. In the portrait interview, Finn Olafsson tells about composing music, the inspiration, his life with music, the guitars he plays, how he kept spirits up after the death of his daughter Maria in August 2013 - and much more - mixed with clips of his music from the videos. On DVD 2 you'll find all the same acoustic guitar music pieces in "tutorial" versions. On this DVD Finn Olafsson's right and left hands are shown simultaneously in close-up - to make it much easier to see how to play the guitar pieces yourself. On the included CD album, "The Audio Tracks", you'll find the very same 'live in the studio' audio tracks of all the 12 guitar pieces in 16-bit CD quality. C.F. Martin 00-42K Robbie Robertson Koa/Italian spruce. Essays: For every video there is an individual, dedicated webpage on Finn Olafsson's website where you can read in much detail about the background for each of the guitar pieces, the story about each of the guitars he is playing in the videos, the different guitar tunings used and some 'how to play it' advice. The essays are extensively illustrated with photos. In April 2016, the double DVD+CD release was followed up by sheet music/TABs of all 12 guitar music pieces that correspond precisely to the video versions. "Finn Olafsson - nye udgivelser. Talentfuld guitarist spiller på mange strenge." Finn Olafsson - Video of the Month 2014"
This project was financially supported by DMFF through KODA's Cultural Contributions.